Who doesn’t love free? The beauty of foraged foods – foods you pick that grow wild that is – is the fact that it costs only your time. OK, I realize that time is money, and that my recipes require things you can’t forage to compete them (as club soda is definitely not something that grows in the wild) but come on people! Free food? I’m on board. In my area there are soo many cool things you can eat growing outside in the woods. Last issue I spoke of Rose Hips. Today it’s crab apples. These are common all across North America and Asia and Europe and there a sooo many varieties! Crab apples are basically small apples, anything under 2 inches. Some are sweeter than others, some are more ornamental but they all have a 5 star middle just like their bigger sibling. Weird fact? Crab apples are part of the rose family (ok it’s a big family along with pears, plums, cherries, peaches, raspberries, and strawberries to list a few). Crab apples, like rose hips, have vitamin C in them but not half as much per 100 grams. What they mostly have is a very powerful flavour which can be used to create amazing jelly, jam, apple butter or… yup drinks! One of my very good friends is a champion Apple liqueur maker. She packs jars with halved crab apples, sugar and vodka and lets them sit for a couple weeks, turning the jars every few day. But this is not something that you can substitute water for and have any success at all – just a lot of brown apples in some horrible tasting liquid. Juicing the apples is an option – if the apples are juicy enough and big enough, but if you want red sweet apple tasting liquid you gotta cook it out of them. And then let it drip and drip and never squeeze or you’ll get cloudy liquid. Remember time is money? Well this whole process is slow and painstaking. My hubby and I went out and picked friends trees for 4 hours until we had two full bins of apples. Then we washed all the bugs off and started the process of cooking them all down. Days, yep days, later we had apple flavoured liquid ready for turning into cordial. Add sugar, cook to dissolve and bottle for winter. How do make this at home? Here is the final perfected recipe. Wash then cut the flower end off the apples. Fill a pot with the apples and add enough water just to almost cover them. The apples should not be floating. Bring to the boil, then turn the heat down and simmer for around 15 minutes without stirring. Strain the apples, without smashing them, through a double layer of muslin (or a cotton pillow case). Let the apples sit for about 3 hours so that all the juice passes through. Set the pulp aside for another recipe. Measure the liquid and write down the amount. Return the apple liquid to the cleaned out pot and boil rapidly for half hour. Skim off any scum that comes to the surface, then stir in 1 cup sugar for every cup on liquid from your initial measurement. Bring to a boil and cook 10 minutes or until the sugar until dissolves. Pour the syrup into sterilized bottles, ready to serve. The cordial will keep for up to three months, stored in the fridge. This makes a great drink. 1 part cordial, one part club soda, a splash of lemon or lime juice and lots of ice. Enjoy! Just like the rose hips from my previous post, crab apples are sweeter after the first frost. So if you are living somewhere where it hasn’t started snowing and/or freezing every night (so south of me), Happy Foraging! I live in one of three UNESCO Geoparks in Canada. Recently I started reading about foods that you can forage or pick that grow wild. One of the most common fruits found across Canada is the rose hip. This vitamin C packed, red seed-filled fruit has been used by ancient Chinese, Persians, Romans and Greeks. It can be used to make tea, jam, jelly, marmalade, soup (yup! The sweedish make a soup called nyponsoppa) or wine or mead. I love the jelly, but prefer making it into a cordial and then mixing into… you guessed it DRINKS! This is a hybrid of online cordial and jelly recipes. It uses a double cook method to extract the most flavour from the pulp and a hint of lemon juice to brighten the flavour of the cordial syrup. Remove the dried flower bit off the ends and wash the rose hips. Put into food processor and roughly chop the rose hips in batches and place in a large pot. Add 2 litres of water. Bring to the boil, then turn the heat down and simmer for around 15 minutes. Strain through a double layer of muslin, letting the pulp sit for a good half hour so that all the juice passes through. Set liquid aside. Put pulp back into the sauce pan and add 1.5 litres of water. Bring back to a boil then turn off heat and allow to infuse for 15 more minutes. Strain through a double layer of muslin again and let drip for half hour. Squeeze out remaining juice and discard pulp. Return all the strained rose hip liquid to the pot, add lemon juice and boil rapidly until the liquid is reduced to 1 litre. Skim off any scum that comes to the surface, then stir in the sugar until dissolved. Pour the syrup into sterilized bottles, ready to serve. The cordial will keep for up to three months, stored in the fridge. So now what? Right? The syrup is too sweet to drink alone so while I could mix it with club soda, I wanted to make the beverage more elegant. Online there are many options for what to do with Rose Hip Cordial that involve alcohol, but what if I don’t want that buzz? This recipe is adapted from Orange Rose Hip Iced Tea and originally calls for dried rose hips steeped like a tea and then cooled and mixed with orange juice and ice. While the end product sounded refreshing – I wanted more of a cocktail and something with a little zing. So I though, why not adapt it to use the cordial and then cut the sweetness with club soda. The result – much nicer but mostly just tasted of orange juice. But you can decide for yourself if you wish to try my recipe adaptation. Pour 1 oz Rose Hip Cordial over ice in a lowball (short) glass. Add orange juice and club soda to fill. Stir and serve with a slice of orange as garnish. Skotlander Rum published a rum based cocktail using rosehip cordial and lime juice that looked interesting and can be found here rose hip cocktail recipe . I removed the rum and added club soda instead for a virgin version. I served this to my family and some of us found that the club soda cut too much of the sweetness out, so when I served it the next time I tried half clubsoda and half tonic water (as it has sugar in it) and found the resulting drink a bit less dry without loosing the sparkle. Fill lowball (short) glass with ice. Pour ingredients over ice and slowly stir. Serve with a rose leaf for garnish if desired. Best time to pick rose hips is after a frost. That was about 4 weeks ago for me up north, but for many of you it could be right now… Happy Foraging! Last valentines day I went crazy with drink making – and this year when I tried to be creative my efforts failed miserably. Utter fail as my kids would say. Hypothesis 1: Ground up and disolved cinnamon hearts will create non alcholic “fireball”. Hypothesis 2: Non alchoholic Fireball would work for a virgin cinnamon apple mojito. I had found a neat mojito on TimesofIndia that I wanted to try for valentines day. Simple right? Mix up some apple juice, lime pop, mint and cinnamon. Should be doable. NOPE. First, I wanted red -so instead of a cinnamon stick, and since it was valentines I grinded down cinnamon hearts and made them into a “fireball” like syrup. But I love cinnamon hearts and had eaten half of them before getting around to making the drink, so while the syrup was red and tasted like cinnamon, it didn’t have much kick. Second, I didn’t have the fresh mint required. 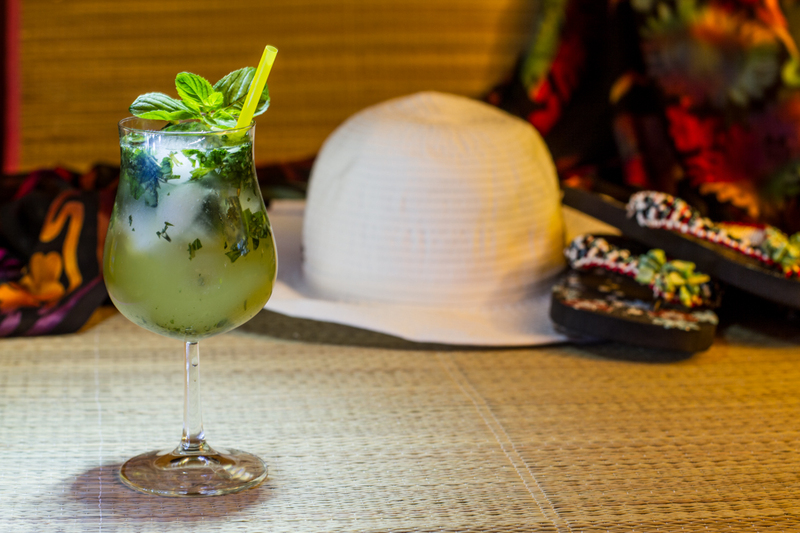 In an attempt to make-do I used mint extract to make my mojito mint syrup. Big mistake! Well, I am still not sure what part of the process was not a mistake to be honest. Turns out that candy cinnamon syrup plus peppermint created a drink that tasted like colgate mixed with soda water. – YUCK! I didn’t even try it on anyone – it was that horrible, a complete and utter fail. However, a true scientist doesn’t give up when the hypothesis proves false. We go back and try something else, a different combo, a different proceedure. Someday, when mint, cinnamon hearts are both available in a store I am frequenting, I will pick them both up and try this again – to test to see if real mint plus candy cinnamon syrup also is grose. And if it is, well I may have to go to real cinnamon syrup and give up the hope of a red drink – and hey by the time this is perfected it may be a great easter drink, or summer, or fall. Never give up, never give in, but most importantly never drink colgate! Raspberry Lemonade. Don’t let the pretty pink colour fool you…It’s got a kick! Summer has come to an end and the kids are back in school. The campers are being washed up and winterized, yards are being cleaned up and gardens harvested. Yesterday we had one last weiner roast in our back yard to celebrate the Labour Day weekend and sat around a camp fire until bedtime. Wood fires are not just a summer thing up north, though. Once the weather cools many up homes in our community supplement gas heat with wood heat. I recently read about the power outage that lasted three days for some in the Lower Mainland of BC, it was a friend of my parents who became the last family to regain power on Wednesday afternoon. Being a Scout leader and general contractor, and basically a totally prepared guy, this family didn’t suffer from the loss of electricity much. You can find the full story in the Vancouver Sun here. Up north power outages are pretty common place, and while we have never gone three days, we have learned that things like wood heat, generators and lots of flashlights & candles is a must especially in the winter when going without heat isn’t an option. 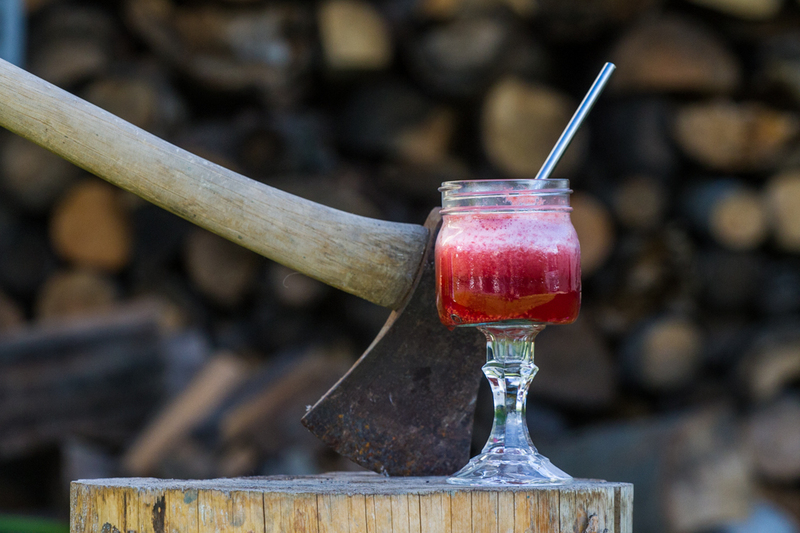 So what to drink when working up a sweat chopping wood or doing fall chores? Recently I posted about my eldest daughter’s over the top lemonade stand success and offered a hint about her special lemonade option for those who were willing to pay the extra. We had named the lemonades simply Traditional and Raspberry but I quickly renamed the latter “Rockin’ Raspberry Lemonade”. At first our clients were hesitant to spend the extra $3 bucks for the upgrade. “Why so expensive?” they would ask. “Ah but you see, we use real raspberries for the flavour, not some synthetic syrup!” I would respond. I had one gal decide to give it a try and buy one for her partner, 10 minutes later she came back for three more. “I sucked that back in about 2 minutes” she said, as she happily ordered more for herself and her friends. So how do you make raspberry lemonade that people will deem worth every penny? Here is the secret recipe – or successful experiment. muddle lemon juice, berry sugar and frozen raspberries in bottom of 32 oz ziploc twist and lock container or boston cocktail shaker (this is too much drink to use a small standard cocktail shaker). Add grenadine, raspberry mix. Fill half full with ice and then add 1 cup water (or enough to cover ice). Seal and shake, shake, shake! Pour through a cocktail strainer (to strain out some of the seeds) into a 16 oz cup half filled with ice. Top with water if needed and garnish with 4 or 5 frozen berries. Add a straw and serve with a smile. At our fundraiser lemonade stand 1 in every 4 chose the raspberry option. The fresh tart raspberries gave the drink a really nice kick and were balanced perfectly with the added sweetness of the syrups. We found we needed very little grenadine —just enough to balance the blue colour of the other syrup— as the flavour would overpower the berries. When making this using a red shot glass we filled the bottom 1/4 with the grenadine and then topped it with blue raspberry syrup in order to make sure we wouldn’t over measure the grenadine. We made these for my younger daughters birthday this August to see how a younger crowd enjoys them. Seven out of Eight loved it. Is it manly enough for a lumberjack? Well I haven’t a true lumberjack in the family, but my wood chopping man loves them. 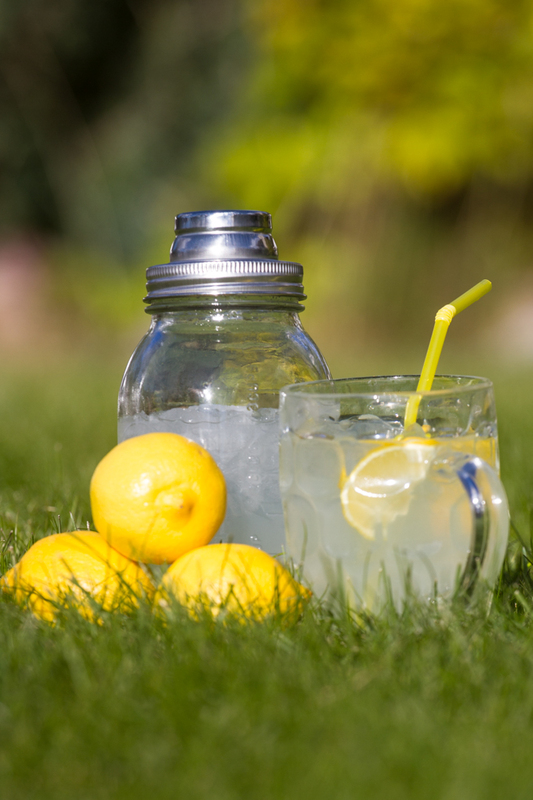 Hand Made Lemonade – because summer doesn’t have to end with Labour Day. My husband is riding on the Tour de North Cycle tour with Cops for Cancer in BC this year. This is a momentous task —over 800km in 7 days— which means that he is cycling 100 km a week to prepare. Another part of his preparation is to fundraise with the proceeds going to Camp Goodtime and cancer research. The reason for this inspired adventure is our daughter, Zoe, who at the age of 6 found out that she had ovarian cancer. Zoe has been cancer free for 5 years now, and she is very excited about the fundraising campaign to help other children. So, this year a week before our music festival —Grizfest— she asked her dad if she could run a lemonade stand at the event as a fundraiser. They proceeded to send a letter to the committee asking if they could have permission and then informing me of the plan. OH DEAR! Lemonade at an event is still food, and thus needs a food safety plan, a food safe person on site, a food permit, and nothing can be made in our own home. Plus they (the father daughter team) wanted to do more than simply mix lemon flavoured powder with water and serve it up à la normal lemonade stand for a child. No, they’ve been watching their mom and her experiments and fancy drinks. So they wanted to do it up grand! Yup, with lemon juice, sugar syrup and individually made drinks for customers using my fancy shakers. So mom (that’s me!) got involved and we all sat down and came up with a compromise that would provide the customer with individual hand made lemonade while working within a food safe setting that would let our plan get passed by the health inspector. Some compromise was necessary, and some testing ensued to find the perfect balance between sweet and sour, but in the end we came up with a recipe for handmade lemonade using ingredients we could purchase at the grocery store —so no making ingredients at home— and could be replicated in a field under a tent with no electricity or running water. Zoe was thrilled as she was given permission by the health inspector to proceed and could even mix the drinks herself, and we raised $450 for Cops for Cancer and sold out of our stock. We even threw in a second “high end” choice and added Raspberry Lemonade with real (frozen) red raspberries muddled into the mix. So if you ever want to make handmade lemonade with your kids and let them have a go at helping out here is the how to list. The Ingredients: First things first – without making anything at home, what ingredients can we mix together cheaply to make a fantastic lemonade? With the ideal sweetening agent (sugar syrup) not being available to purchase I suggested using berry sugar which is finer than granulated, and hopefully would dissolve in the water with some shaking. Lo and behold, it was a success! The second concern was the element of practicality – fresh squeezed lemon juice was not going to work as there was too much waste and slowed the process, so we settled on bottled lemon juice (but the good stuff: Real Lemon brand). After that it was just a matter of adjusting the amount of each along with the water and ice to get the perfect balance between sweet and tangy. We added a wedge of lemon for garnish, a straw and were ready for mass production. A food permit. Your local health inspector will have a list of what is required to get the go ahead. Basics normally include having food safe or someone with food safe on premise, creating a food safety plan, and having the appropriate working environment. As home kitchens are not food safe for selling stuff for profit I would recommend keeping this to a front yard endeavour and you won’t need to worry about a permit. A work station. Even a front yard space needs somewhere for the “vendor” to sell their wares. For us we used a first up tent just to keep it contained, but the more important part was a plastic portable table to work on and coolers to hold the ingredients. If you use the hand made approach hands get sticky. I really liked the hand washing station recommended by our health inspector and plan on using that for our camping trips from now on. All that is required is a small bench/stool, a bucket, a roll of paper towel, pump hand soap and a coleman (or other brand) 5 gallon water carrier. Fill the water carrier with hot water from your sink, prop it on it’s side on the bench, put a bucket under to catch the dirty water and stick the towels and soap on the bench beside it. Instant running water and hand washing station! The tools. To make individual recipes we wanted to measure our ingredients like a pro as we mixed them, so jiggers or something that could measure ounces was required. I settled on the 2 oz red disposable shot cups that were chap and plentiful for the liquid ingredients, and some plastic measuring cups for the dry ingredients. Another compromise was our shakers: in our testing phase we realized quickly that the standard martini shaker wasn’t going to be roomy enough to adequately mix the volume of ingredients we were serving. (Did I mention our cup size was the big red solo cup?) The other challenge was that our sweetener needed to dissolve. This meant that there was a whole lot of shakin goin’ on! The solution: Ziplock twist and lock 32 oz round storage containers, which were perfect for this, lots of room and no spilling as you shake. My husband picked up “The Mason Shaker” for me as a bonus, it’s size is ideal for larger drinks and it worked beautifully. Along with that we used a cocktail strainer, standard cocktail shaker base (for measuring ice & water) a knife and cutting board to slice up fresh lemons for garnish and squeeze bottles to make pouring lemon juice simpler. Ok so what is the perfect recipe? Well that normally depends on how sweet or sour you like your lemonade but here is a way to have both options. Measure and pour lemon juice and sugar into a ziplock or mason shaker. Measure ice to fill half of the bottom of a standard martini shaker (a plastic 2 cup shaker/measuring cup works well too) and add water to just cover the ice. Pour this into the larger shaker, seal and shake shake shake! Here is the choice part: if you prefer a more tart lemonade strain the lemonade over fresh ice half filling a 16 oz cup and top with water if needed. If you prefer a sweeter lemonade pour the entire contents of shaker (ice and all) into the 16 oz cup and top with water if needed. What’s the diff? There will be some undissolved sugar clinging to the ice in the shaker giving the second option a sweeter flavour. Either way top with a wedge of lemon squeezed and then dropped into the cup, add a straw and smile at your new happy customer as you pass the drink to them. Sold Out!! We ran the lemonade stand for two days – each day for 5 hours and had many return customers. In total we used 6 bottles of lemon juice, 5 bags of berry sugar, 16 bags of ice and 1 1/2 bags of lemons. I figure we served 125 lemonades over the two day period. This project was designed for my 12 year old and she can now replicate it at home with ease. For a younger age group I would recommend adult supervision just to avoid too much “wasted” ingredients due to spillage and to control the number of times they forget not to lick their fingers!